It’s still blazing hot where I live, but I’m already thinking about fall… and all the delicious seasonal foods that goes with the cooler months coming up. Two vegetables that we enjoy eating during the fall and winter months are butternut squash and Brussels sprouts. My favourite way to prepare these lovely vegetables are by roasting them. Okay, that’s pretty much my favourite way to prepare most vegetables. It’s so easy to toss everything on a sheet pan with seasonings and a little oil and let the oven do the work. The result is super delicious, hot, lightly browned (with crispy edges!) veggies. The flavour that results from roasting is just so delicious and something that I don’t think you can get from eating them raw or by blanching or sautéing vegetables alone. I asked Scott what he thought of this recipe. "Growing up, I only had steamed Brussels sprouts and I wasn't a fan. Roasting them makes all the difference and now I frequently request Brussels sprouts either in this recipe or your simple Roasted Brussels Sprouts with Balsamic Maple Glaze recipe. In this recipe you get a wonderful variety of colours, textures, and flavours. Plus, all those vegetables make it easy to keep on eating without feeling too guilty." Just a few ingredients to get a flavourful side dish. NOTE: I chopped the butternut squash too large; I ended up cutting the squash down further so that they are closer in size to the Brussels sprouts. 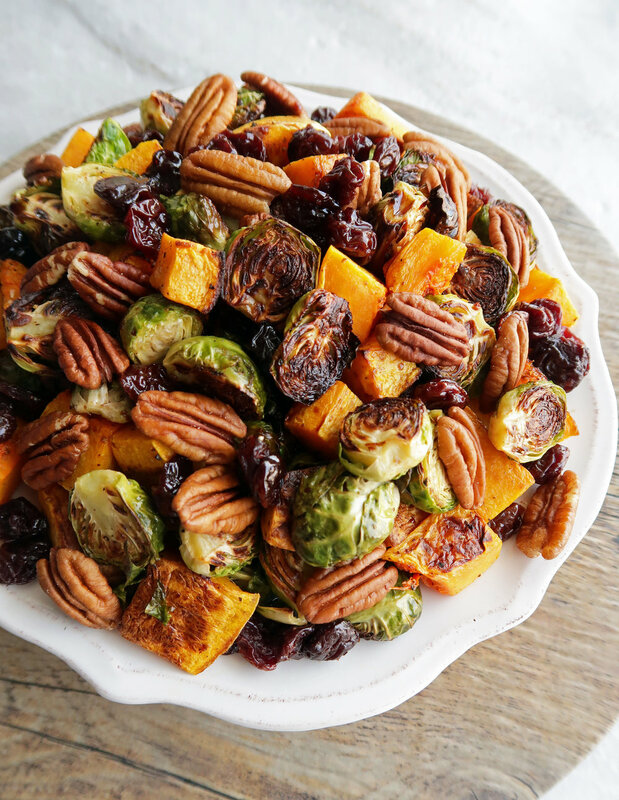 On a baking sheet, combine the butternut squash and Brussels sprouts with olive oil, salt, and pepper. Bake at 425 degrees F, stirring and rotating the baking sheet halfway through, for 25-30 minutes. Look at the charred, crispy bits on the outside while the vegetables are tender on the inside. So tasty! Add the crunchy pecans and sweet dried cherries and finish off with maple syrup and balsamic vinegar sauce on top. Toss to combine and serve! Now back to the star vegetables in this wonderful one-pan side dish. First, butternut squash has a sweet, rich nutty flavour that works well with sweet and savoury flavours and warm spices. Some people say that it tastes like a sweet potato. I love blending down roasted butternut squash to make soups as well. Second, Brussels sprouts taste somewhat similar to cabbage; the sprouts bring a hearty crunch that you would expect from cabbage with a slight bitter note, but it also has a slightly sweet, nutty flavour, especially when roasted. Pick smaller, bright green, tightly compact, and firm sprouts; they tend to be sweeter and less bitter than their larger counterparts. Both vegetables are super delicious and nutritious; jammed packed with vitamins and nutrients. In particular, butternut squash contains high amounts of vitamin A, is low in calories, and high in fibre while Brussels sprouts are high in vitamins C, K, and folate. The dried cherries add a pop of sweetness and the pecans give a nutty textural contrast. The maple-balsamic dressing ties it all together with it’s rich, sweet, tangy, tart flavours. Did I mention that this recipe is also vegan, gluten-free, and paleo? So it’s great for those with certain dietary restrictions as well. Overall, it is such a warm, filling side dish. I hope you enjoy this recipe. Place the butternut squash and Brussels sprouts in a large roasting pan so they are in a single layer and not overlapping. Add olive oil, salt, and pepper to the vegetables and toss to coat. Roast for 25-30 minutes, stirring and rotating the baking sheet halfway through, until vegetables are cooked through and lightly browned. 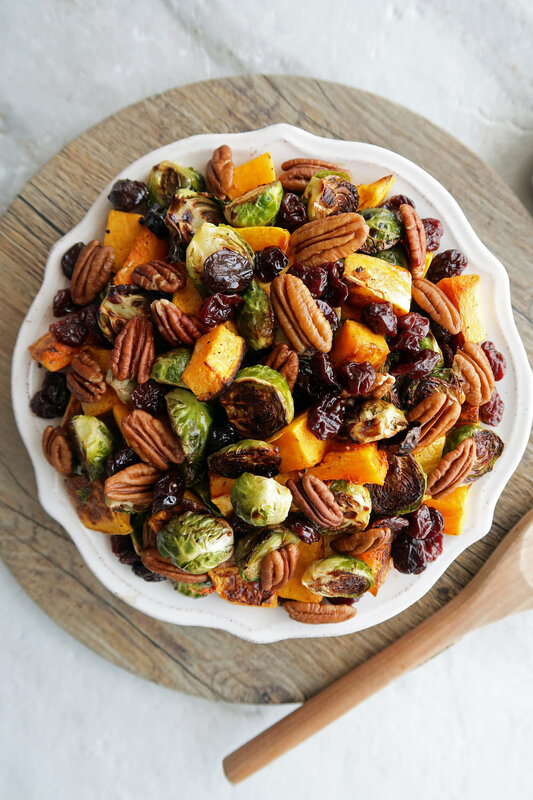 Once the vegetables are removed from the oven, plate the vegetables in a large serving dish and top with the dried cherries and pecans. Whisk together the balsamic vinegar and maple syrup in a small bowl before drizzling the mixture on top of the vegetables. Give them a final toss to incorporate all the ingredients together. Serve immediately. Make sure that the butternut squash and Brussels sprouts are cut so that they are relatively similar in size. This helps ensure that they will be cooked through at the same time. Calories are based on four servings.